Have you ever had a week where random, yet similar events keep happening and it forces you to pause and take notice? Maybe you keep seeing the same animal, or you keep seeing feathers, maybe a few people have made the same comment. It may well be simply a coincidence, it may be synchronicity. I’d like to share my story of synchronicity this week to see if it resonates with you. For the past several months, I seem to keep seeing elephants. I’ll see them on FaceBook posts, people will have pictures or paintings in their house. For a while it was happening so much that I mentioned it to a colleague who suggested I should do a Google search on the “spiritual significance of elephants”. There was a time I would have raised my eyebrows, looked away and changed the subject because this seemed like a crazy idea. However, I have spent the last few years exploring the concept of the mind-body-spirit connection as it relates to physical and emotional healing, and have become much more open-minded to this type of suggestion. So I looked it up and got the following: “Symbolic elephant meaning deals primarily with strength, honor, stability and patience“. That seemed kinda cool, but I didn’t give it much more thought. … Until this week. On Monday I was on my way to meet a friend for coffee. As I parked the car, there was an email indicating a comment on last week’s blog. The comment related my post about the current health care system being “the elephant in the room”, something we can’t ignore any longer. Then as I met my friend, the second sentence out of her mouth was “ok, let’s deal with the elephant in the room”. I didn’t even let her finish as I laughed out loud and shared how I had seen that comment about 5 minutes ago. After the meeting, I came home and wrote a post in a FaceBook group sharing this story and we had a few good laughs and a few interpretations of what the symbolism might be. More on that in a moment. Yesterday, I met a client in his office and as soon as I sat down, I noticed a picture of an elephant sitting on his credenza. What? Really? Cue Twilight Zone music. I couldn’t help but share the story with the client. This morning I was on FaceBook and the second or third feed was a book review for a book entitled … wait for it … “The Elephant in the Room“. How would you react to a series of unconnected moments like this? Would you take it as some sort of sign or symbolism? Would you look deeper for meaning? Would you take it as a “message from the Universe”? Lots of different people will have lots of different ideas and I’d love to hear yours. For me, my interpretation at the moment is that it’s more about the significance of the “elephant in the room” than it is about the “elephant” in and of itself. “Elephant in the room” is an English metaphorical idiom for an obvious truth that is either being ignored or going unaddressed. The idiomatic expression also applies to an obvious problem or risk no one wants to discuss. As much as my colleague indicated that the healthcare system really is the elephant in the room that can’t be ignored any longer, another colleague suggested that I should ask myself if there’s an elephant in my room. 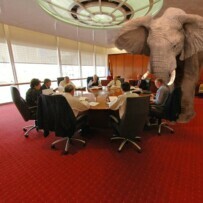 Is there something going on in my life that represents an elephant in the room? And the truth is that there is. Actually there are two of them. And it is time to face them both. I can’t ignore them any longer. I don’t have to have all the answers in the immediate moment, but I do have to stop ignoring them. What about you? Is there an elephant in your room? Or are you experiencing moments of synchronicity that you just can’t ignore? Have some fun with it. Explore it a bit. There may be more than one possible meaning. Which one resonates with you the most? I have had a connection to Ganesha (elephant headed Hindu god who is the remover of obstacles and bringer of joy) since early 2003 when he showed up in a meditation. Before that I knew that elephants were highly evolved creatures who mourn the death of members of their herd. More recently I have become aware of elephants through a friend, who went to India and fell in love with the pachyderms she saw there. Since then, I, too have become more aware of elephants and their behaviors. Most recently I found this wonderful posting about elephants and their symbolism in both the east and the west. We have very different views on these gentle giants. I understand the concept of elephant in the room. For me, what needs to be acknowledged is how much we have to learn about being human from these amazing beings. This post was awesome. I got chills when I was reading it. Very powerful indeed! Thanks for sharing. It is interesting how those seemingly unconnected events all mentioned the elephant. I think it the universes way of saying “you are ready to start to deal with this and I’m going to keep placing it in front of you until you take action”. In my field of Osteopathy there are patients that come in with the same problems time after time and I try to point out that they may need to address an emotional component, for example, of their problem before they can have some kind of resolution of their pain/problem. Tanks for the blog. I gotta go address my “elephant”. Thanks for sharing Shaun, much wisdom in your comments. A lot of people are waking up to the realities you describe, some are taking a bit longer. Keep up the great work, and good luck with the elephant :). Love it, and I think my journey is going to bring me into the field of mental health as I keep having those thoughts. Not sure what it’s going to look like yet, I’ve surrendered the “how” for now. Thanks for commenting. Yes! Synchronicity is intriguing – these almost unbelievable coincidences can help us to make connections in our lives that we might not make otherwise. but I was directed here by ‘mistake’. Mike,the guy who runs the blog lost a daughter and would often see white feathers as a personal sign from his daughter.He has since collected other white feather stories and weird coincidental happenings and reported them on his blog. Maybe synchronicity is the elephant that has been walking around your room and this is a way to hint to you that you should be paying more attention to the subject ? It’s funny as I just did a post on my blog about the zebra in the room. As I see (or don’t see rather) the zebra in the room being a good metaphor for synchronicity,as it can be not so obvious to spot at times,unlike the elephant,but I guess an elephant can be a good metaphor for the sync that has grown just too big to ignore any longer. Metaphors and synchronicities guide us and keep us on the path to healing. Here is my newsletter from from December focusing in on those moments of grace when two synchronicities occur simultaneously. http://www.letmagichappen.com/newsletter/issue/winter_solstice_2012. This post was very interesting. My nephew died almost 12 years ago and my sister had his nursery decorated in jungle animals. On his room door was an elephant saying robs room. Then when he died four weeks before his due date the nurse asked my sister what she wanted for his crib… She said “the baby elephant”. That night my mum went home and the next morning entered the room she had for robbie and the sticker of an elephant had moved across the room and embedded itself behind the radiator I waked in to find her sat unable to explain it all…. When we said goodbye to my nephew we all bought little trinkets I got him Ganesh a statue to protect his little rose bush…. Ever since his passing things have been connected to elephants… If I’m down or sad one will come on tv, when I need reassurance I’ll see one!!! For a while it was sporadic on my 21st birthday I was given Ganesh incense sticks and tarot cards as well as a card with a dumbo on it. Then when my sister found out she was pregnant I went out and got a huge dumbo for robbie because I didn’t want him to think I’d forgotten…. A couple of years later I was at an event and a poor guy sat across from me sits down and says julie (I don’t know this guy in anyway he was a date of someone sat at our table for my friends graduation ball) robbie jay says hi…. Yes that’s what he said! He continues he proud of you for starting university, loves his new brother oh and auntie julie he loves his dumbo… Now no one knew about this aside him and I!!! I named my undergraduate thesis the heffalumps journey and it is because of that little boy I finished my phd…. All the while receiving a few messages with elephants…. More recently it’s gotten more synchronised if you will…. I’m unsure about something in my personal life, work is crazy, I’m under pressure and I put pressure on myself… I’m asking a number of questions and recently everytime I do I see an elephant… All week when I think naaa I can’t do it anymore one come on tv in fact right now an ad for elephant tv show on the 21st to save them… Today I watched a tv show I had seen an elephant in background of yesterday for the first time… I even laughed and thought ok that’s not a sign I saw that elephant yesterday while watching only two second later for the main character to walk into the room wearing wait for it! Elephant Pajamas to which she states out look look im wearing elephant Jim jams!!! I mean come on… Il watching TV ive recorded at 2am then I fw it only to see a huge pink elephant! Now life is hectic and I a sure patience is my lesson here because im anything but… However this is definitely meaningful right?? ?